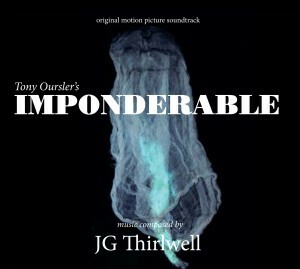 JG Thirlwell | JG Thirlwell’s “Imponderable” soundtrack out now! We are excited to announce the release of JG Thirlwell‘s soundtrack to the Tony Oursler film, Imponderable. The film Imponderable is currently being exhibited as a “5-D” cinematic installation at the Museum of Modern Art (from Jun 18 2016 – April 16 2017). The 14 track soundtrack album is available now on CD and digitally. The CD is packaged in a deluxe digipack with silver foil lettering and a 48 page color booklet containing stills from the film and images from Oursler’s archive of supernatural and occult phenomena. You can hear previews from the album here. Tony Oursler is a renowned multimedia and video artist whose art covers a range of mediums. He and Thirlwell have collaborated on several other projects in the past, including Sound Digressions in Seven Colors (2006), and Oursler also produced acclaimed work for David Bowie, including videos and stage sets. Oursler’s works have been exhibited in many institutions including the Tate Modern, Centre Pompidou, MOCA Los Angeles, Hirshhorn Museum, Whitney Museum, Venice Bienale and elsewhere. The album is available NOW exclusively from the Foetus Shoppe and at the Museum of Modern Art.